The game is a highly -strategic, kitty-powered vesion of Russian Roulette. 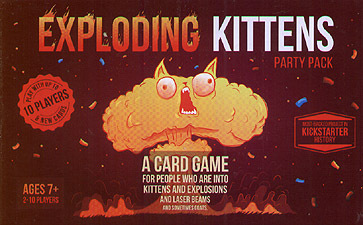 Players draw cards until someone draws an Exploding Kitten, at which point they explode, they are dead, and they are out of the gazme. Unelss that player has a defuse card, which can defuse the kitten using things like laser pointers, belly rubs,and catnip sandwiches. All of the other cards in the deck are used to move, mitigate, or avoid the Exploding Kittens. This box includes cards from the original Exploding Kittens deck, the Imploding Kittens Expansion deck and Ten New Cards. Plays party music when the box is opened.